When you install Skulljack, suffer 1 brain damage. The trash cost of all cards is lowered by 1. The implanted brain-machine interface, or "skulljack," is the single most common cybernetic enhancement that isn't a medical necessity. Scrubber is an almost universally superior card to this. They have the same install cost, but this also has the heavy additional cost of suffering a brain damage. 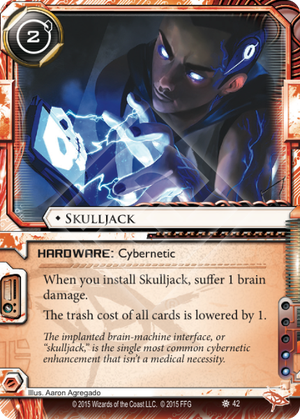 The brain damage can be avoided by installing Chrome Parlor first, but with the present cybernetics card choices it is very difficult to justify fitting this into a deck. Once installed, in order for this to pay off better than Scrubber's two recurring credits, you would need to trash at least 3 cards in a single turn. Also, Scrubber is not unique, so you can install multiple of them if you draw them. The only advantage this has over Scrubber is that it is hardware, which is harder to destroy, but that does not even come close to justifying playing this card. Even the rarely-played Paricia is significantly better than this. Don't play this card in serious decks. With all the asset and upgrade spam happening these days, such as in RP and NEH, this card is nothing but a 1 cheaper Desperado that synergizes well with Chrome Parlor and other cybernetics, especially Titanium Ribs. Since you probably want Chrome Parlor and/or Titanium Ribs in your deck anyway, both of these being good cards in their own right, this card is actually playable, unlike Desperado. It's still not as good as a Sure Gamble, but not much is. It's way better than Scrubber because hardware is much more permanent than resources.